Outside of Korea, Yoo Ji-tae is primarily known as a key actor in Park Chan-wook's award-winning flick "Old Boy". In the movie, Yoo's character shows off an extremely calm posturing; however, deep inside his heart is burning with an incontrollable emotion of revenge. Back to the reality, Yoo does not want to limit his scope to the domain of acting. Although he's a much sought-after actor, he is not secretive about his burgeoning ambition as a filmmaker. Previously, he made two short films, which have not made it to the theaters. This time, finally, Yoo's third short film, titled "Out of My Intention" (Nado moreugae), has achieved something bigger and more commercial. The 24-minute-long film will be screened from March 20 at Sponghouse in Gwanghwamun, Seoul. The screening period is limited to just a week given the film's brief running time and arthouse nature; nonetheless, the release clearly marks Yoo's formal debut as a director. 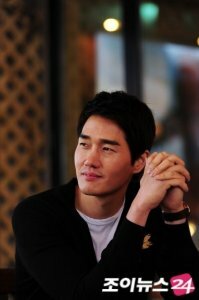 "Out of My Intention" starts off with a middle-aged man (played by Lee Dae-yeon) seen driving a car in downtown Seoul. The overall tone appears gloomy, with the sky downcast and the outside view, intermittently glimpsed through the window, fuzzy and blurry. The camera switches between the man's sullen face and a pretty girl (Jo An), about 20 years younger than he is. Their dialogue is barely recognizable in terms of content, but the mood suggests that they are in a sort of verbal fight. She wants to clear up the wrangling but he does not give in to her repeated request for clarification. The movie does not make it super-secret about the mixture of present and past since the couple talks to each other constantly but the camera never shows them in the same screen. They are separated, obviously by the means of time, and the continued blocking between the two evokes curiosity among the audience. Director Yoo is not so generous about detailed explanations about what really happened. Perhaps he does not need to do so. After all, a short film lasting less than 30 minutes is hamstrung in the first place, and redundant details are by no means welcome. An emotional tug of war between the two is also juxtaposed with the fantasy shots where the female character is dressed up as a cutie doll in a land where dreams go uninhibited. For Yoo, short films' greater tolerance for ambiguity and brevity is appealing. "If I had made the film into a full feature, I would have had to give all of the sundry reasons and episodes about their initial relationships", he said. Yoo told the local media that for artistic diversity the Korean cinema should pay more attention to short films in a way that offers alternative choices for moviegoers at a time when only the mainstream commercial flicks manage to survive. Yoo's new film is set to join the competition section of the Kyoto Short Film Festival in June this year, a development that is not so negative for a part-time filmmaker, for he remains a professional actor: starting from next Monday, he will join the shooting for "Sunjeong Manhwa", a romantic film directed by Ryu Jang-ha.